I found this letter by accident yesterday while I was searching for something else. Apparently, it’s very famous but I had never seen it before, and it struck me as unbearably moving. It was written by Sir William Waller to his friend Sir Ralph Hopton on 16th June 1643, during the (First) English Civil War and it is the last known communication between the two men. The former was a General in the Parliamentarian army, the latter held the same rank in the Royalist army. This one heartbreaking letter reveals the tragedy that was unfolding all over the country at the time, as friends and families were torn apart by forces not of their making but that proved impossible to to resist. It seems that countries are doomed to do this from time to time. The experience I have of your worth and the happiness I have enjoyed in your friendship are wounding considerations when I look at this present distance between us. Certainly my affection to you is so unchangeable that hostility itself cannot violate my friendship, but I must be true wherein the cause I serve. That great God, which is the searcher of my heart, knows with what a sad sense I go about this service, and with what a perfect hatred I detest this war without an enemy; but I look upon it as an Opus Domini and that is enough to silence all passion in me. The God of peace in his good time will send us peace. In the meantime, we are upon the stage and must act those parts that are assigned to us in this tragedy. Let us do so in a way of honour and without personal animosities. Whatever the outcome I will never willingly relinquish the title of Your most affectionated friend. Following the eventual defeat of the Royalist cause Sir Ralph Hopton fled to the Continent with the young Prince Charles. He died of fever in Bruges in 1651. Sir William Waller served as a Member of Parliament but became increasingly disillusioned with the new Commonwealth and subsequently worked for the Restoration of the Monarchy, which began in 1660 with Charles II. Waller died in 1668. For those of you not familiar with Twitter, its main characteristic is that messages posted on it (“tweets”) are limited to 140 characters. To outsiders this seems to imply that all tweets are banal and pointless, but this is far from the case. The strict length limit forces a form of creativity that is both rare and wonderful. The stroke of genius in this case was to realize that the Pepys Diaries could be tweeted in chunks of the right size, in a manner that almost suggests they were designed for the purpose! But it’s not just the fascinating political context that makes these tweets so interesting. They also give glimpses of everyday life in the 17th Century. Pepys was in poor health for much of his life, for example, and there are frequent references to various physicians and their quack remedies. He also manages to conjure up in just a few words the extraordinary atmosphere and energy of the London of the period, along with some of its excesses (especially drinking and fornication). 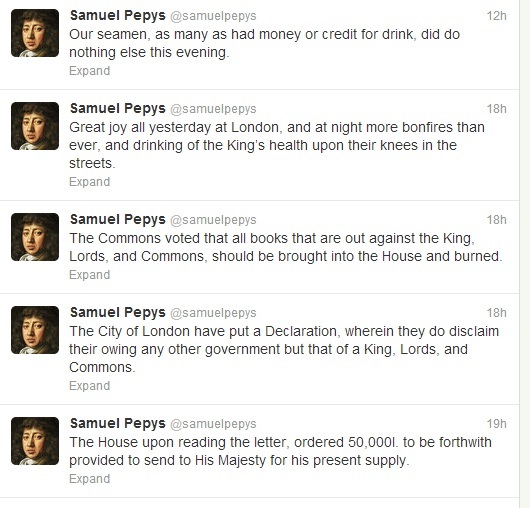 Following Pepys’ Twitter feed opens a window into 17th Century England, and what comes through it is both refreshing and illuminating. The reason I find this particularly delightful is something that I’ve blogged about before, so won’t repeat at length. I was a very late developer from an education point of view until I was helped with my reading and arithmetic by a wonderful old lady who lived next door. She encouraged me to read and, after a big struggle, I eventually got the hang of it. After a time I had caught up with the rest of the class in School and eventually managed to read just about every book the School had to offer, including the Diaries of Samuel Pepys which were for some reason on the shelves in Class 2 and which I was allowed to borrow. I don’t think anyone had read them before so nobody, including the teachers, knew how rude they were in places. The Restoration period was generally rather bawdy, and Pepys’ Diaries reflect that. 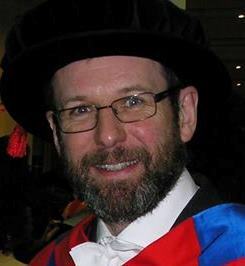 I had no idea at that time, of course, that less than ten years later I would be studying at Magdalene College, Cambridge, site of the Pepys Library where the orignal diaries are kept as well as the rest of Pepys’ own collection of rare books and music.